One bedroom with king-size bed, stone fireplace, large built-in wardrobe, and chest of drawers. One bedroom with queen-size bed, wardrobe, wooden desk and window with view toward the valley and sea. One fully furnished kitchen-diner with oven, fridge/freezer, washing machine, dishwasher, toaster, kettle, and a large table for breakfast. One living room with large sofa-bed (double queen size bed), two armchairs, TV and Satellite set, large bow-windows with view, fireplace. One bathroom with shower cubicle and separate wc stall. One patio with table and chairs for outdoor living. Located in the pedestrian centre of Castagneto Carducci, two garden apartments with amazing view toward the valley and sea. Parking 1 min walking. Each apartment has its own terrace for dining and independent entrance. They can be rented separately or together. The properties are high-standard furnished and have a big garden with independent patios and BBQ. Castagneto is a small and charming village centered around "Della Gherardesca" castle, in the heath of Maremma, with great heritage of ancient Etruscan and Italian renaissance culture. It offers a choice of excellent restaurants, wine bars, wine shops, museum and crafts market. The closest beach of Marina di Donoratico (8km) offers water-sports facilities including beauty farm 'Tombolo' with thalasso therapy. Wines and olive oil can be purchased directly from producers along the world famous 'road of wine' from C.C. to Bolgheri (10km). Local Festas and food festivals are organized throughout the countryside from April to November. Public parking 150 mt from the house (Jun-Aug. 1€/hr fee on 9-17 hrs, other months free). Free parking in via Bolgherese (up/right on the map, 2' walking from the house). Notes on accommodation: Maiden: end of stay cleaning included (>5 days). Extra cleaning is available upon request and can be arranged on site. Outside: Outside: Large garden with cypresses, plants, flowers, patios, external shower, and BBQ for outdoor living. The garden is delimited by a wall of stones, useful to keep safe for children and pets. Much nicer than pictures can show, lovely garden, clean and Corina is always helpful whenever anything is needed. La casa è meravigliosa, dotata di tutti i comfort, la posizione perfetta con una vista incantevole. L'accoglienza puntuale e precisa e molto efficiente! Die Wohnung Peter ist sehr geräumig, gepflegt und sauber, toll restauriert und geschmackvoll eingerichtet. Sie ist mit allem ausgestattet, was man braucht - Waschmaschine, Spülmaschine, Liegestühle im Garten, Grill, reichlich Sitzgelegenheiten drinnen und draußen, Schlafplätze für 6 Personen (Ausklapp-Sofa im Wohnzimmer), Klimaanlage, WLAN, .... Sie ist noch schöner als auf den Fotos und wir haben uns sehr wohl gefühlt. Ganz toll war in Anbetracht des heißen Sommers die Klimaanlage! Terrasse und Garten sind traumhaft und wir haben viel Zeit draußen verbracht mit wunderschönem Meerblick. Die Wohnung liegt sehr zentral in einem sehr gemütlichen mittelalterlichen Ort mit romantischen Gassen, Restaurants (bei Cappellaccio gibt es superleckere Muscheln und riesige Pizzen - reservieren! ;-)), Bars, kleine Läden und Sommerprogramm auf der Piazza. Zum Strand sind es ca 6 km. Castagneto Carducci ist zudem von vielen sehenswerten Orten umgeben, die alle recht gut erreichbar sind (z.B. Siena, Pisa, Florenz, Lucca, Volterra, San Gimignano, Bolgheri ...). Der Gastgeber und auch Corina vor Ort sind beide sehr freundlich und hilfsbereit. Vielen Dank!! Es war ein wunderschöner Urlaub und wir kommen bestimmt wieder! Dorf ist. Von hier aus kann man viele interessante Ziele in der Toskana erkunden. Das einzig Negative war leider die enorme Lärmbelästigung durch die Mieter(keine Feriengäste) in der oberen Wohnung. Wir wurden fast täglich gegen 5.00 morgens von extremem Lärm geweckt und auch am Nachmittag war meistens an Ruhe und Erholung nicht zu denken.Wer also in seinem Urlaub gerne ausschläft und sich häufig am Tag in der Wohnung aufhält, ist die Wohnung nicht geeignet. Wir waren tagsüber meistens unterwegs, wenn wir es uns dann während unseres Aufenthaltes ausnahmsweise in der Wohnung gemütlich machen wollten, war dies unmöglich. Vielleicht sollte der Eigentümer über eine Trittschalldämmung nachdenken, bzw. die Mieter der oberen Wohnung darauf hinweisen, etwas Rücksicht zu nehmen. Wir denken, dass es nicht unbedingt sein muss, morgens um 5.00 bis ca. 7.00 mit Stöckelschuhen durch die Wohnung zu trampeln und das Kind mit Bobbycar, Inlineskatern durch die Wohnung toben zu lassen. Stellenweise hat es sich angehört, als würde ein Hubschrauber auf dem Dach landen (ohne Übertreibung). Die Wohnung ist wie beschrieben sehr schön eingerichtet, hat ein kleines Gärtchen und liegt sehr zentral. Wir haben jeden Abend im Ort sehr gut gegessen. Bad und Küche perfekt (Kaffee"maschine" = italienischer Kaffeekocher) und alle möglichen Geräte vorhanden, bis zum Bügeleisen, Tiefkühlfach, Fön, Geschirrspüler und Waschmaschine. Für empfindliche Ohren kann es im Schlafzimmer, das zur Fußgängerstraße öffnet, etwas laut sein von heimkehrenden Touristen. Das zweite Schlafzimmer ist zum Garten ausgerichtet und ruhig. Der einzige Wermutstropfen für uns war, dass um diese Jahreszeit (Anfang Oktober) die Sonne nicht mehr bis auf die Terrasse kam, da diese etwas eingezogen ist. Wir haben unseren Urlaub dort sehr genossen und können die Wohnung nur weiterempfehlen. Thanks Sybille, you were a perfect guest and I hope to see you back soon! Die Wohnung ist gut ausgestattet. Super war der große Kühlschrank mit kleinem Gefrierfach. Die Wohnung hat einen kleinen, gepflegten Garten. Auf der Terrasse kann man ungestört Frühstücken oder Abends bei einem Glas Wein verweilen und dabei den wunderbaren Ausblick auf das Meer mit Sonnenuntergang genießen. Leider hatten wir etwas Pech mit dem Wetter und konnten dies nicht ausreichend nutzen. Die Wohnung liegt absolut zentral, so dass wir alle Restaurants und kleinen Geschäfte zu Fuß gut erreichen konnten. Man kann hier überall sehr lecker essen. Die Übergabe der Wohnung bei An- und Abreise hat super funktioniert. Corina war immer nett, pünktlich zur Stelle und jederzeit telefonisch zu erreichen. Wir sind schweren Herzens abgereist und haben Castagneto Carducci und die Unterkunft auf unsere Favoritenliste gesetzt. The whole coast is studded with beautiful beaches. Marina di Donoratico (8km) has typical Tuscany seaside facilities with restaurants on the beach, water-sport facilities, and 'Cavallino Matto' Luna park for children. Gulf of Baratti with Etruscan archaeological park of Populonia is 18km away, and sailing facilities of San Vincenzo and Punta Ala marinas are 10/30km away. San Vincenzo port (10km) offers night bars and social life. Pisa airport is 70km away and Florence is 120km away. Railway station in Donoratico (3km), and bus service from Castagneto Carducci from/to Donoratico and from/to Marina di Castagneto. Although there are regional Bus Lines from Donoratico to all main towns in Tuscany, the car is recommended to fully enjoy the holiday in this district. 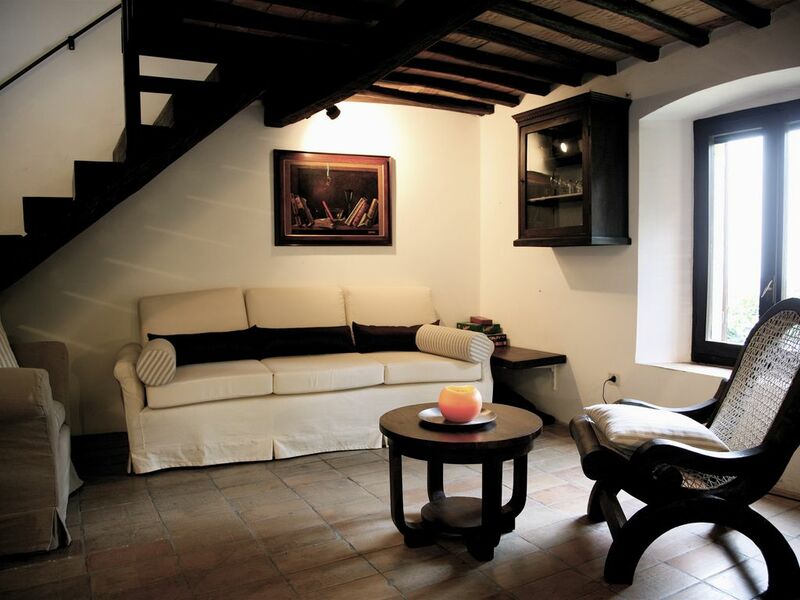 The apartments are situated in Castagneto Carducci, where there are basic services, e.g. pharmacy, banks with ATM, and small food shops. Larger town of Donoratico with supermarkets and railway station is 3km away. The area is one of the best medieval hill towns district, with wooded hills, olive groves, and internationally famous vineyards centred in Bolgheri (10km away). The archaeological area of Populonia in the Gulf of Baratti is 18km away. Elba island and Napoleon's villa is reached by ferry (0.5 hours) from the port of Piombino, 35km away. Towers of San Gimignano and Pisa are 45/60km away, and Siena and Florence one and half hours by car through beautiful hills of Tuscany. Booking Notes: Bookings are made through the website, but the balance of the rent (Payment 2) has to be settled either by bank transfer or Paypal directly to the owner. Please disregard notices about Payment 2 from the website (usually 2 weeks before the arrival), and get in touch with the owner by mail or message. If the payment is not settled before the arrival, it will be due in cash to the local representative on the arrival day. Local representative will show the apartment and provide the keys. Long-renting: For renting of 3 weeks and longer, specific discounts on standard rates can be negotiated. Please write an inquire for that. Changeover Day: Flexible changeover day during low season. Arrival and departure any time conditional on availability of previous and next let. Changeover day on Saturday during high season (June-September).